The ballista was, in effect, a very large, very powerful crossbow usually mounted on a tower, on the castle wall, or in the hoarding. To use it, a soldier would wind back a winch using a crank, take aim by swiveling it on the mount, and pull the trigger mechanism releasing the tension on the rope and firing. Ballistas were generally used against advancing infantry during a siege. 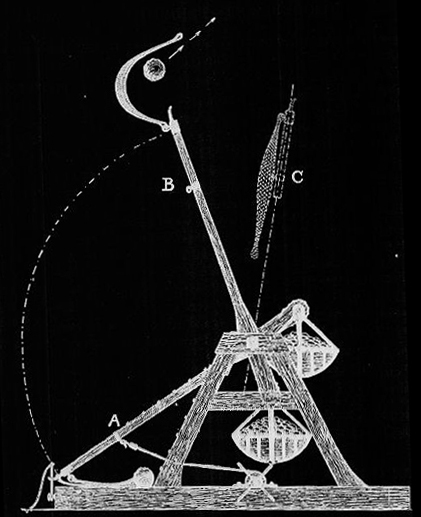 The ballista fired a wooden dart, about five feet long with brass flights to keep it's firing trajectory straight and an iron head to penetrate armor. 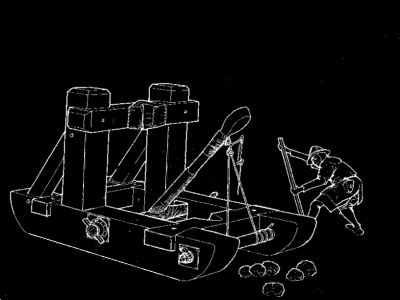 The Mangonel also used tensional energy built up into a twisted rope. 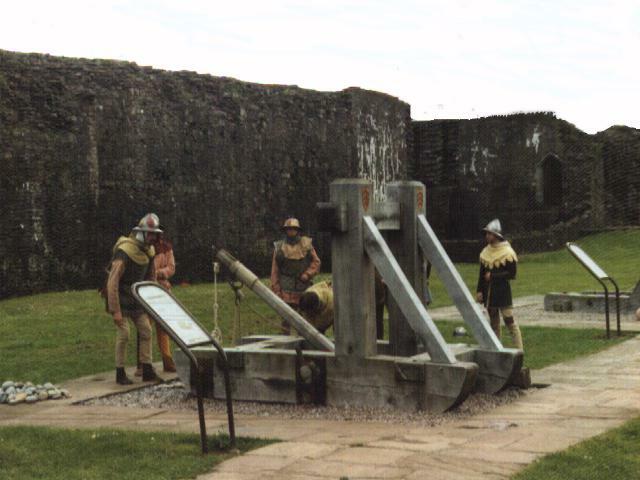 It was often mounted on a tower for defense against attack but was more frequently used in ground attack against the castle. 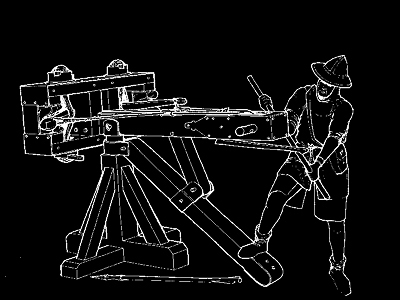 The mangonel was in fact quite an inefficient weapon in physical terms: The tension of the rope generated an enormous force, which required a heavy framework to avoid the sides being pulled in. But despite being so large, it only threw a small projectile of perhaps 5 or 6 lbs. They were most useful in hurling burning pitch, or a napalm-like substance known as Greek Fire. 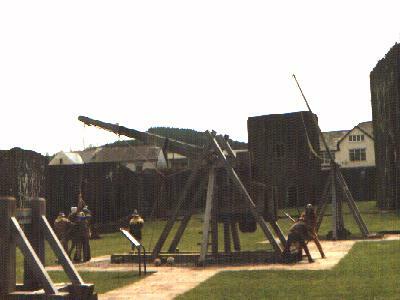 Prior to the use of cannons (before gun powder was well known in Europe), the trebuchet was perhaps the most deadly weapon against a castle. It was capable of launching a greater payload a greater distance and with more devastating a force than any other siege engine. As shown in the picture, a long firing arm is drawn back with a rope or chain, lifting a counterweight on the other side of the axis. when the chain is released, the firing arm whips up and over the axis, launching the projectile at the castle wall. 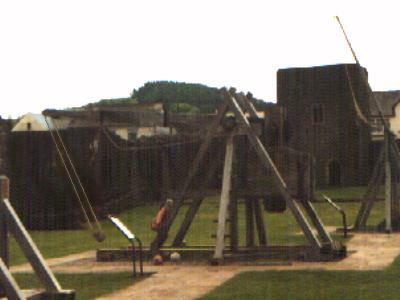 Not shown in the picture, many trebuchets were based on wheels which rolled slightly backward and jerked forward as it fired. 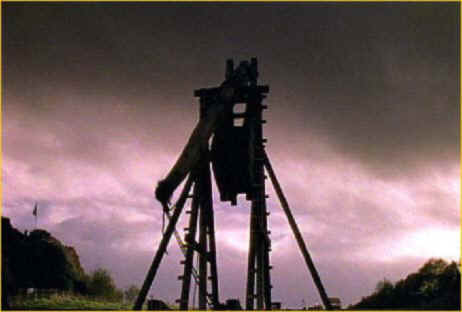 This absorbed some of the stress helping the mechanism retain structural integrity; more importantly, the forward motion made the trebuchet fire farther and harder. 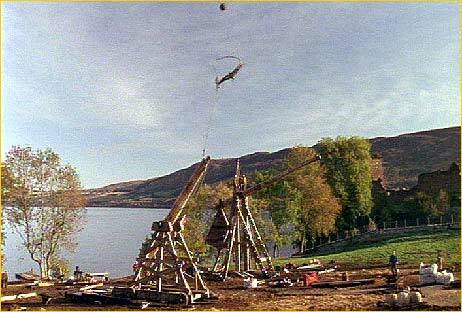 The trebuchet was primarily an offensive siege weapon. It may have been used defensively from inside the bailey but could not have been mounted on a tower as it would have shaken the stone masonry to pieces.